SOCAL BEACH YOGA BRINGS A TWIST TO A LOCAL STAPLE IN ENCINITAS! Have you ever been on the water’s edge and as the sun kissed your skin and salty air soothed your senses thought – what a perfect place to practice yoga! You’re not alone! A new beachside yoga option in Encinitas takes you right to the water’s edge. The enormous bluffs of Encinitas provide ideal seclusion from iPhones and traffic signals as yogis sink back into the peaceful serenity of minds harmonized with the breath, body, and healing natural elements. 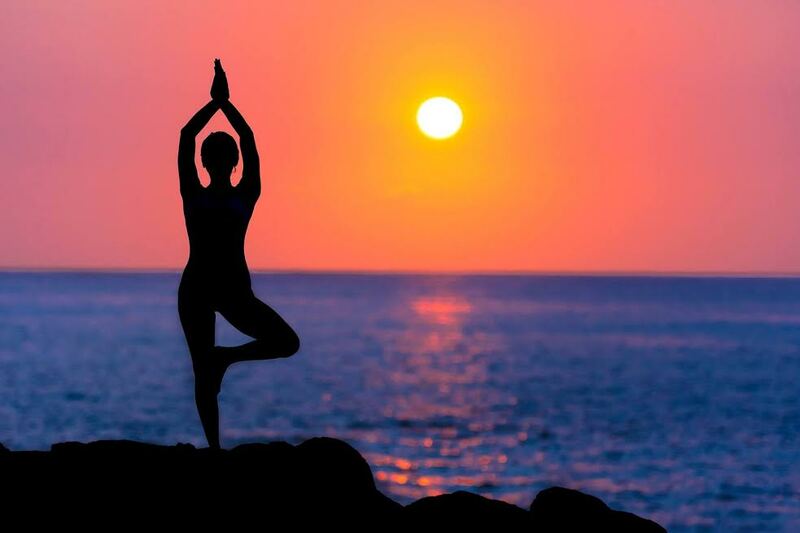 Socal Beach Yoga holds sessions at Swami’s, Moonlight, and Grandview beaches and offers a unique option for those looking to challenge their muscles differently and stretch their minds. 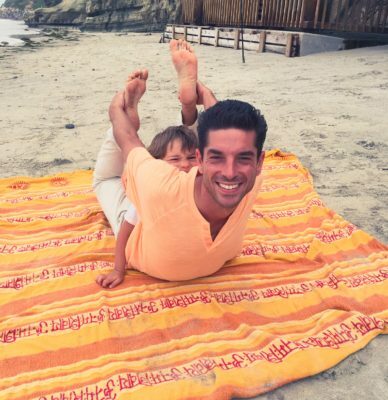 Jay, who directs the content of the sessions, draws inspiration from his eclectic family history of yogis and diverse range of experience teaching beach yoga. His grandmother who has been traveling regularly to India for 50 years, lectures on meditation and self-realization in the Chicagoland area were Jay was raised. He uses his grandmother’s compassion and wisdom to guide him in his teaching along with inspiration from his ancestor Siegmund Breitbart, the Jewish “Superman of the Ages” who amid rising anti-semitism in the 1920’s used yoga exercises and diet to become strong enough to bend steel, be named the strongest man in the world, and inspire two young Jews to create the Superman comic a decade later. Jay used Siegmund’s teachings on yoga and strength to help several Northwestern University athletic programs to new heights, using the University’s beaches as an ideal training ground. The success of the beach yoga techniques at Northwestern led to a position as partner and lead instructor of Chicago’s largest beach yoga company and distinction by the Chicago Tribune as having the best outdoor yoga in the city. 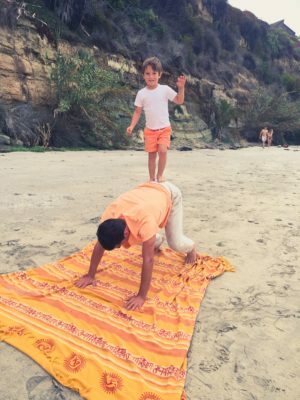 In Encinitas now with his 4 year-old son and enthusiastic co-instructor D.J., Jay hopes to assist yogis forge a deeper relationship with their breath, mind, and body, enhancing their ability to cope with life’s sometimes wild challenges. In “Lion Mind Yoga”, young yogis 3-9 years of age are challenged just the same as their parents to direct attention at length toward their breath and visual focal points, as well as cultivate awareness of their thoughts, emotions, and breathing patterns, providing a unique chance to gain the practical responsive tools they need when the sandals go back on. This kids offering, along with the challenging yet compassionate adult sessions, he hopes will serve as a boost for all those climbing bravely toward their unique highest potentials. The 45 minute sessions are offered at $9 and reservations are available at socalbeachyoga.com.